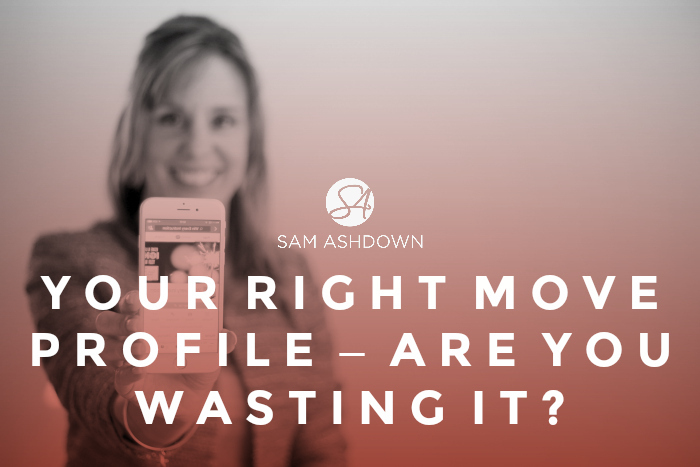 Your Rightmove profile – are you wasting it? Your Rightmove profile can be a great opportunity to connect with and engage your audience. Here are my tips to make every word count. I’ve been working with some clients recently on their Rightmove profiles. As I’ve been clicking around, checking out examples on Rightmove, I’ve seen some horrors! Some agents don’t know how to spell, (it’s not independant, it’s independent!!) and others have basically copied and pasted all the text off their website – YUK!! Your Rightmove profile should be a showcase for your company and services – after all, it probably gets a ton more visitors than your website, so make it count. If yours passes the Sam test, well done! Research tells us that on average, we – the great British public – have to see a brand seven times before we take any action. This means that most of the interaction with your brand is completely invisible to you. By the time a prospective vendor finds your agent profile on Rightmove, they are probably filtering, based on your portfolio size and type, and the way your agency comes across in the profile piece. Here is your opportunity to make sure you’re on the shortlist of three that we know around two thirds of people will invite to give a market appraisal. So let’s look at how you can optimise every part of your agent profile, to really wow those readers and encourage them to pick up the phone – now! Your profile photograph – if you use a self-promotional photograph, say your office, your logo, or a liveried car, you’re not going to really engage a vendor and interest them, are you? What’s important to them? Remember – people buy people – so show them a photo of you or your team, and let them see who you are. Your text – a quick check through some of the agent profiles on Rightmove shows that most agents’ profiles are just too long. 150 words are plenty. Your readers aren’t going to read any more anyway. Who’s speaking? Remember that you are talking directly to your potential customer here. Why not say “Hello, I’m Tom from Downton Estate Agents and I’d like to welcome you to our page” or something similar. You have a great opportunity here to make that connection, and it works much more strongly if you talk as a real person. Call to action – what do you want a vendor to do when they have read your profile? Keep your request simple and add a benefit to them. Eg“Call me – Tom – on 01823 3456 If you’d like to have a chat about this, drop me a line at sam@samashdown.co.uk – I’d love to hear from you.